Fusi Mofokeng and Tshokolo Mokoena are standing in front of a Cash Crusaders in Bethlehem in the Free State. They're both wearing leather jackets. Through the glass door they see Colin Packenham Robertshaw, in a bright orange and green Cash Crusaders T-shirt, interacting with customers, smiling and chatting, processing purchases. 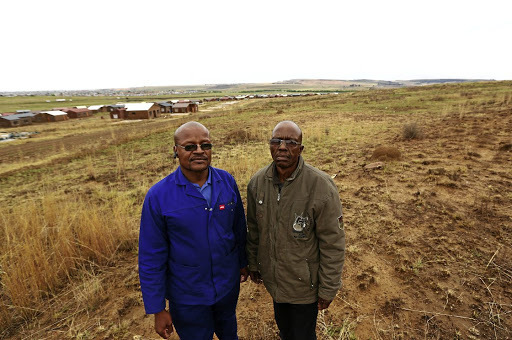 Mofokeng and Mokoena are two men in their 50s from Bohlokong, a township next to Bethlehem. Their hands are calloused and chapped from manual labour; Mofokeng works as a carpenter and Mokoena as a welder for the municipality. Robertshaw, who runs the shop, is a man in his 60s. Like Mofokeng and Mokoena, he wears glasses. Mofokeng, who speaks in slow, careful sentences, observes his interlocutor with focused eyes from under his glasses. Mokoena struggles and stumbles over words due to a stutter, but he is also a soft-spoken man. The men knock on the glass door and Robertshaw looks up. His sales-friendly expression morphs into a look of suspicion. While seemingly nothing but geography and bad eyesight ties these men together, when their paths crossed 25 years ago, it had disastrous consequences. In 1992, Robertshaw, who was the head of the apartheid security police in Bethlehem at the time, ordered the arrest of Mofokeng and Mokoena for a crime they never committed, but which sent them to prison for 19 years. Now Mofokeng and Mokoena feel it is time to finally confront the man who slapped Mofokeng during the investigation into the murder and attempted robbery. The reason the men feel emboldened, Mofokeng says, is that their case might be reviewed in the near future. They hope that their 25-year fight to prove their innocence will finally be resolved. Three months ago, their pro bono lawyers, Odette Geldenhuys and Carol Steinberg of Webber Wentzel, submitted a petition for a presidential pardon to the minister of justice. The provision in the Criminal Procedure Act that deals with presidential pardons outlines the legal route an applicant should take. The Department of Justice should be petitioned with further evidence that has become available since the conviction. The justice minister may then decide that the petition is directed to the trial court. This court will assess new evidence and advise the president whether such evidence affects the conviction. The president has the power to decide if a full pardon will be provided. "I'm Fusi Mofokeng," Mofokeng starts when the former police officer appears at the door. Robertshaw looks at him and crosses his arms over his chest. He doesn't seem to recognise the men, but then, a bit too quickly, he blurts out: "Oh yes, I remember, you were involved in that shooting." He speaks loudly and clearly, with the ease of someone who is accustomed to being in charge. Mofokeng and Mokoena's ordeal with Robertshaw could have ended in death. In 1988, Robertshaw worked for the security police in Ladybrand and his unit abducted and "disappeared" three ANC members in Lesotho. He applied for amnesty for the crime with the Truth and Reconciliation Commission in 1997. During his hearing, Robertshaw explained what his personal perspective was on the political situation in the country: "My impression was that we were involved in an actual war with these people and that we would have to do anything in our capabilities to try and stop what was going on, what the ANC were trying to do." But those days are long gone. In 2017, Robertshaw is seemingly a paragon of middle-class success with his flourishing business in the centre of town. The trajectory of Mofokeng and Mokoena's lives has been troubled and hard since they were released on early parole in 2011. Mofokeng is employed as a carpenter for the municipality of Dihlabeng. Since he started in 2011, he has been promoted several times. Mokoena is a welder at the parks department. He single-handedly constructed a huge rectangular metal structure measuring 250m by 150m and 3.5m high, when a tender to build the structure went awry. Netting is wrapped around the frame, shielding a nursery with a variety of plants, shrubs and saplings from birds and other creatures. Both men have families. A little girl called Karabo came into Mokoena's life shortly after his release. She is now five. Two years ago, Mofokeng found out he had a daughter, Nyaleng. On her deathbed, Nyaleng's aunt confessed that her real father lived down the road in Bohlokong. When Nyaleng contacted Mofokeng, he knew the rumours he had heard for years were true: that he had a daughter who was born a few years before his arrest. She recently gave birth to his first grandchild, a son. So while the men are slowly piecing their lives together again, the puzzle is still very far from completion. Formally, they are still subject to parole conditions and they have a criminal record. But the biggest missing piece, they say, is a house. Ballyduff is a bucolic area just outside Bethlehem with a scattering of smallholdings, set against a backdrop of undulating hills and a small lake. On April 2 1992, a bakkie parked in the driveway of a farm that belonged to the Orsmond family. When it idled there for more than 30 minutes, the residents became concerned and called the police. The police arrived and faced eight heavily armed men in the bakkie. A shootout ensued; one officer died on the scene and another was seriously injured. The eight men were part of an ANC self-defence unit that was transporting arms to KwaZulu-Natal, where a conflict was brewing with Inkatha. Two men escaped into Lesotho and were never found again, two died in a second shootout and the remaining four were arrested the following night in Bohlokong. One of the eight men was Johannes Nxala, Mofokeng's brother-in-law. He had dropped by the house Mofokeng shared with his brother Amos that day, to borrow some money from Amos. He returned that evening and asked the brothers for shelter, because he had just been involved in a shootout. A vintage baby-blue Ford bakkie is parked outside a house on a busy road in Bohlokong. An old man in an overall and cap and a young boy are bent over the open bonnet. The engine produces unhealthy revving sounds. The old man looks up as Mofokeng and Mokoena approach. He squints. The cataracts in his eyes are a creamy blue. The man's croaky voice is shrill and husky at the same time. He was a police officer and Mofokeng's landlord in 1992. Mofokeng describes his old landlord as a humble "comrade", who returned a watch Mofokeng had lost during his arrest. But the old man refuses to talk about the case and does not want to be named. "I do not want to get involved," he says decidedly. He returns to the exposed engine. We walk around the house to a cottage at the back. This is where the police knocked down Mofokeng's door in the early morning of April 3 1992. "They shouted: 'Bula! Bula! Maak oop!' I heard them running on the roof. When I opened the door, they told me I had killed a police officer. They messed the place up, they broke everything in the house. I thought they would only take Nxala away, but to my surprise they arrested me, my brother and Nxala. "They asked me who I had seen that day and I told them I had spent time with my friend Tshokolo," says Mofokeng, who worked at a Checkers supermarket at the time. "They beat me like a snake," Mokoena says. We're at the house where his arrest took place. He rented a room at the back of a ramshackle house, just off the main thoroughfare in the township, walking distance from where Mofokeng used to live. Loud knocking awoke him and when he opened the door to see who it was, the police grabbed him and beat him up so badly, it permanently damaged his left eye. While Mofokeng knew that his brother-in-law was in trouble and that the security police were hot on his heels, Mokoena was completely unsuspecting, clueless. "They said I killed a policeman. I told them: 'I was at work the whole day.' My boss confirmed it. But they still didn't believe me. "I will never forget that day. It was the last day I saw my mother and my father," Mokoena says, tears in his eyes. His parents died while he was incarcerated and he was not allowed to attend their funerals, something that still haunts him. Mofokeng also missed the funerals of his mother, father and brother while he was behind bars. "It left a hole in my heart," he says. In 1993, the High Court in Bloemfontein convicted the men and sentenced them to life imprisonment for robbery, attempted murder and murder, under the doctrine of common purpose. The only evidence against Mofokeng and Mokoena was a witness statement from Thabo Motaung, an acquaintance of Mofokeng's who testified that they had conspired to rob and kill Orsmond. Several years later, Motaung visited Mofokeng in Kroonstad prison and admitted that he had lied. "He told me the police had offered him money to testify against us," Mofokeng says of the visit. Motaung died several months later. "We were viewed as black killers of a white cop, so our treatment in prison before the end of apartheid was bad," Mofokeng says. The country's transition to a new dispensation ushered in hopes of change. When the TRC held its sessions throughout the country, Mofokeng and Mokoena along with their co-accused were called to testify. In an unbearably cruel twist, the TRC ruled that the self-defence unit members should be pardoned, because theirs was deemed a politically motivated crime. Mofokeng and Mokoena, however, were sent back to prison, because they had nothing to confess. Wrongful convictions, so the men were told, were not part of the TRC's mandate. What followed were years in prison, which both men spent writing letter after letter. Mofokeng, who diligently wrote two copies of every letter by hand, petitioned the high court for leave to appeal, which was granted, but the appeal was dismissed. He wrote to the public protector, the human rights commission, the NPA, various ministers, various presidents and eventually, in 2011, the Wits Justice Project. "I was so depressed at one point, that I could barely feel myself. I lost a lot of weight and with it, the will to live," Mofokeng recently said during a roundtable hosted by the Wits Justice Project on wrongful convictions. Being unable to attend the funerals of his nearest and dearest exacerbated his already dire mental state. Around 2011, the local community of churches and ANC chapters successfully campaigned for their early release. Being freed, though, does not mean the men are liberated. "I'm afraid of snakes," Mofokeng says as he looks at the dry, knee-high grass in Vogelfontein, a partially developed housing site across the road from Bohlokong. The handful of completed RDP houses look dilapidated: windows are broken, doors unhinged. "Some people have moved in already, but the houses are not connected to water and electricity," Mofokeng says as he very carefully positions his feet in the grass. We walk beyond the small houses to a flat clearing that leads to a hill. This is where the men want to live. "I'm 56 years old," Mokoena says, as he looks at the empty space in front of him. "And I'm still renting. What about Karabo? I want to provide a home for her." In 2011, when local dignitaries and community members celebrated the release of the two men, the mayor of Dihlabeng (the municipality under which Bethlehem falls), Tjhetane Mofokeng, and the then mayor of Mangaung, Thabo Manyoni, promised to rectify the wrongs of the past by helping the men rebuild their lives. That promise, to provide them with a plot of land and building materials, has thus far not been implemented. After their release, the Wits Justice Project put Mofokeng and Mokoena in touch with lawyers at Webber Wentzel, who set out to draft a petition for a presidential pardon, a remedy that has never before been utilised. Mofokeng and Mokoena have spent a quarter century of their lives trying to prove their innocence. "All my youth years ebbed away in prison," Mofokeng says. But despite that loss, he tries to be positive. "When I compare this government to the apartheid-era government, I see there is humanity, so I am hopeful." At the Cash Crusaders, Robertshaw responds angrily when I raise the issue of the wrongful arrest and conviction. He turns to Mofokeng, who is silently peering at him over his spectacles, a tiny sad smile playing around his lips. Mofokeng's calm contrasts with Robertshaw's mounting agitation. "You came there with the intention to rob a farm here in Ballyduff. You shot a policeman dead on the ground. We dug the bullets up, there was a trail of bullets in the ground where they stood over the policeman and shot him in his head," Robertshaw says. "So I don't know what you want. You were part of it, because you were arrested. Look, I don't want to talk about it." He closes the door in Mofokeng and Mokoena's faces. "The security police's job was mainly to kill. Robertshaw told me: 'You were lucky that we didn't kill you,'" Mofokeng says as he walks back to the car parked in front of the shop. During the police investigation, miraculously, Mofokeng was barely assaulted. The only person who used physical violence against him was Robertshaw. "When I told him I was not involved in the crime, he slapped me and I fell on a table," Mofokeng recalls. "According to him, we are dogs," Mokoena adds. "But he is also worried, that this thing will backfire." On July 31, Mofokeng and Mokoena’s lawyers submitted a petition for a presidential pardon based on section 327 of the Criminal Procedure Act with the Department of Justice. The minister of justice will assess new evidence that has become available since the conviction and might decide to have the petition directed to the trial court. This court would assess the new evidence and advise the president if the evidence affected the conviction. The president can then decide to expunge the conviction ‘as if [it had] never occurred.